Well, it's DAY 3 of the Great Harry Potter Re-Readathon, and I'm at about page 200 of The Sorcerer's Stone. My feelings at the moment: I love Harry Potter, wow book one is SHORT, and damn I'm going to have to step it up a notch if I'm going to finish the series by January 31st. --Holy cow, it takes 100 pages (one-third of the book!) before Harry actually makes it to Hogwarts! --Damn, Hermione is so obnoxious and whiny in the first 150 pages, but I do not care. I was a Hermione at eleven. I get her. I'm glad that Ron and Harry eventually get her, too. --Hehehehehehe I KNOW ABOUT SNAPE! --This first book is light on plot and heavy on world-building and foundation-setting and I do not care one whit. --Harry says a lot of things coolly. It does delight me to find that I remember so many things from these books--not just narrative or character details, but actual sentences and paragraphs. They're imprinted on my brain--turns of phrase, punchlines. I've read this first book maybe 6-7 times, but I read my favorite sections many more times. It occurs to me that Fred and George may have given me my early love of all things banter. I'm zipping along, just basking in the details, but it is always interesting when I come along slight variations between the books and the films. 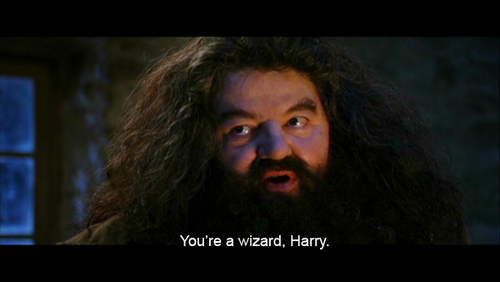 For example, how many times do we repeat the line, "You're a wizard, Harry!" in Hagrid's inflection? The actual line in the book is, "Harry, you're a wizard." Slight difference, but it's curious to see how the film's version is the one that gets circulated. Also, I'm struck by how the narration really keeps us from getting inside of Harry's head. We see his excitement and confusion a lot from the outside, and we occasionally are party to his private feelings, but we don't get much of it. Perhaps we won't, not until Harry knows more about Voldemort and his own past, and his worries and fears increase. Nonetheless, it's ever so much fun and I am going to finish off book one tonight! See you in the Chamber of Secrets!